Fisher-Price has always had great toys. Unlike Marx, Fisher Price has stayed in business and has continued to be very popular. Even still, I think the toys they made back in the 70's were better than the ones they make now. Everyone loved the old pull toys and the Fisher Price Little People or as we always called them, "round people". A lesser-known series from Fisher Price is the Adventure People, or Adventure Series. There were many different sets of Adventure People. They were made for older kids than the little people. I did exactly what Fisher-Price wanted me to do. I went straight from loving FP Little People to loving FP Adventure People. 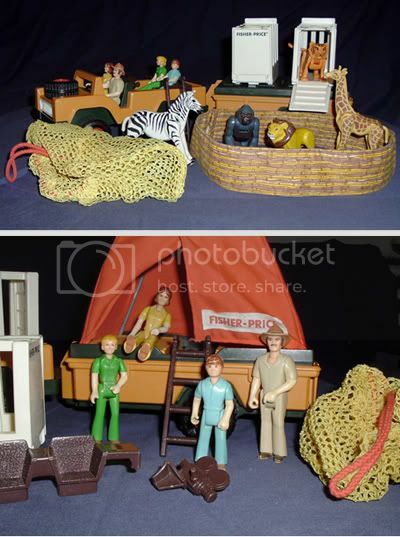 According to ThisOldToy.com, The Adventure Series began in 1975 with four sets. They were: #303 The Emergency Rescue Truck, #304 The Wild Animal Safari, #305 The Air-Sea Rescue Copter, #306 The Daredevil Sport Plane. 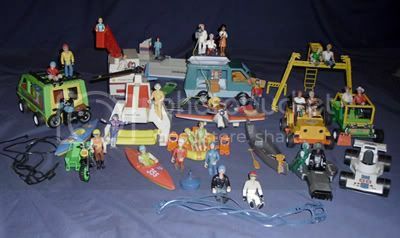 I had all of these sets and many others (shown above). The first one I got was the safari set, which was and still is my favorite! They look pretty good for being over 30 years old don't they? These toys have really been played with too. They logged many hours, inside and outside. When I grew up I let my little brother and sister-in law play with them, and then my own kids played with them too - very durable toys! The saying "They don't make 'em like they used to" is definitely true with these adventure people. I have much more that I could write about, but in case you are already bored with this post, I will save the rest for later. 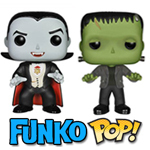 I do want to show you my 2nd and 3rd favorite sets though. 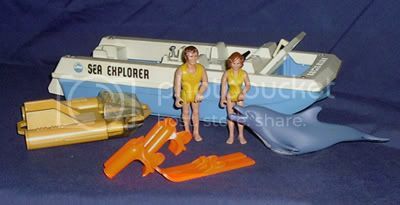 They were the 5th and 8th sets made (both in 1976), #307 The Wilderness Patrol and #310 The Sea Explorer. There were many other sets made. You can see them all detailed at ThisOldToy.com. Do you remember The FP Adventure People? What was your favorite? Even if you didn't have any of the sets, chances are good that you had the Daredevil Skydiver. Remember the man in the white suite wearing a vinyl parachute with rubber harnesses. What fun it was throwing him high in the air and watching him drift down, down, down... right into a tree or on the roof!